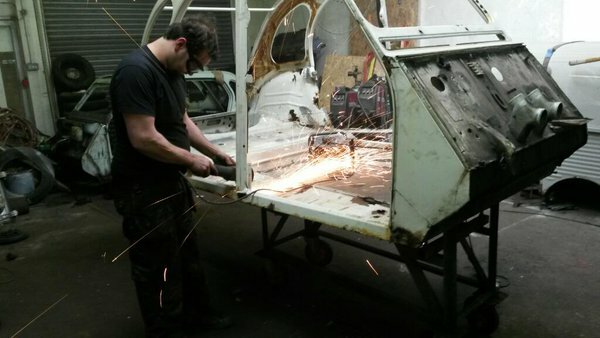 Project 2CV: Chop Chop! – HubNut – celebrating the average! I’m just back home after a remarkably enjoyable few days on the road. I’ll tell you about the other stuff some other time, but as many of you have chucked money into my project fund, it seems only right to first focus on the 2CV. So here goes! I got to Citwins in Bradford at about quarter to ten this morning. Not as early as I’d planned, as I managed to end up at Alan’s house after entering the wrong postcode! Clearly, my brain was not firing on all cylinders on this sunny Monday morning. Tea was consumed, and we looked at Elly’s naked body and talked through the plan. Which was mostly for Alan to get an angle grinder out and start chopping. A few minutes later, that’s exactly what he started doing after removing the windscreen and rear side glass. Alan starts chopping out the rot. Note the trolley that the bodyshell is resting on. This is a jig that allows Alan to line up all the bolt holes. A bolt-in frame is holding up the front bulkhead here, which allows him to do some serious chopping. So serious in fact that a short time later, this happened! Eek! Floors and lower bulkhead chopped out in one piece. Yes, that’s the entire floor, sills, lower bulkhead and chunks of the C posts all off in one piece. A lot of rotten bodywork. Alan was hampered by previous welding work carried out by my mate Dave. Never let it be said that Dave’s welds aren’t solid! Though I was sad to see bits of our old washing machine heading for the scrap bin. It amused me to have the dead machine living on in my 2CV. After this, Alan noticed a problem with what remained of the bulkhead. It was four layers in places, where new metal had been let in over the old metal. This would be a right pain to weld to. The decision was made to chop even more bulkhead out. At this point, Alan had to dash off for more repair panels. The rear seat box was also in worse shape than predicted. Nearly all of it would need replacing. I went to fetch lunch in the meantime, and when I got back, new metal had been installed! New C post section tacked in. Note jig (red) to hold the body in shape. I was astonished. This had gone from a teardown to a restoration in seemingly no time at all. There is still more rot to be chopped out – notably the inner rear wings, boot floor, rear light panel and windscreen panel. There are other spots of localised rot to sort out too. That work can take place once the structure is more solid again. With the new A and C posts tacked into place, the sills could then follow. After that, the lower bulkhead (a larger piece than first intended), floors and rear seat box could follow. Suddenly, it looked rather more like a solid 2CV shell again! Looking better! Panels tacked and clamped into place. How utterly fantastic. Sure, there’s still a lot of work to do, but I had to leave just after the above photo was taken, and that was at 3pm. It seemed a pretty decent showing for five hours of work, especially as parts-fetching took up a good half an hour, and we had a (very) brief pause for lunch too. We are so fortunate with 2CVs that so many aftermarket panels are available. Very little has to be constructed from scratch and after many years of production, a lot of these panels seem to fit pretty well. That wasn’t always the case! It saves huge amounts of time, though the panel bill alone for this restoration is going to be over £1400 I suspect. I’ve already spent £1260 of the project fund, which leaves a rather perilous £860 for labour. I suspect this will not be enough by quite some way. Restoration is an expensive business! However, your support has made this happen. I’m hugely grateful for that. Even with my improved finances of late, this project just would not be possible. As it stands, there’s now a really good chance of me getting Elly back on the road in time for mine and Rachel’s tenth wedding anniversary in July. Obviously, the 2CV needs to be a key part of this, just as she was before. I’ve got my work cut out! A very special day, almost ten years ago! PS – If you’ve seen pics of me swanning about in a Jaguar XJS, I should point out that it isn’t mine! Don’t worry, Project Elly funds are for Project Elly only. Hi, I need to work on our 2CV aswell, replacing lots of bodywork. Alan uses a jig to put the A, B and C posts in the correct position. Is there any chance i can get a description (or pictures) with measurements to build our own jig? Regards, Alex from the Netherlands. Best bet is to contact Alan directly via http://www.citwins.co.uk Thanks.